CM Magazine: A Fish Named Glub. Dan Bar-el. Illustrated by Josée Bisaillon. Review by Gregory Bryan and Chasity Findlay. "I've been working this diner my whole life," whispers Foster, a reef knot in his throat. "But I wanted to be a sailor when I was a kid. Did you know that, fish? That was my dream, to sail the seven seas." Glub shakes his head. This was news to him. "You and me, fish, we're kind of alike, huh? People see us all the time, but they don't know us." Glub considers. Glub agrees. "We live in a glass house." A Fish Named Glub involves a fish and a chef at a diner. Both are wondering about their lot in life. Glub, the fish, is left in Willikers' Diner and is contemplating his place in the world. "Who am I? Where do I come from? What do I need?" wonders Glub. Foster Williker, the chef, interacts with many people each day but feels that no one really knows him. He is similarly wondering about where he has come from and where he is going. 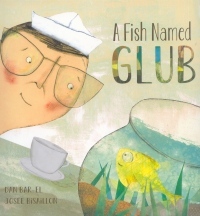 Dan Bar-el's stylistic word choices allow the reader to appreciate Glub's journey of self-discovery. 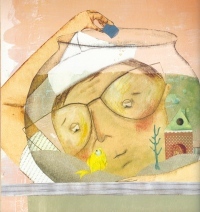 Particularly early in the book, from one page to the next, Glub is obtaining the answers to his questions by observing life outside his glass bowl. A clever "glass house" play on words embraces Foster's sense of his own station in life - surrounded by others, yet somehow isolated from them. This metaphor allows the reader to see the parallel between the symbolic and the physical. Such a parallel is complemented by Josée Bisaillon's artwork. The mixed media collage illustrations work together to present a world that consists of realism and imagination. Bisaillon has drawn and coloured much of the artwork but has cut and pasted other sharper, geometric shapes, blending together Foster's world outside the fishbowl and Glub's world within. Bisaillon's collages are heavily textured. The artwork consists predominantly of a cool palate of greens, browns, and blues. Where warm colours are employed, they tend to be soft and muted. This use of colour reflects the sense of isolation that the story protagonists feel. Rather than being in warm and convivial surroundings, they feel all alone in the world. Whilst we appreciate the quality of the writing and illustrations, we wonder who A Fish Named Glub is for. The publisher has suggested a target audience of pre-kindergarteners to grade threes. The themes of a sense of belonging, the meaning of life, and the pursuit of dreams are important. Yet, we feel that these ideas will not be fully appreciated nor be of particular interest to many young readers. The artwork and story seem geared toward young children; however, the big ideas are more suited for an older audience. Dr. Gregory Bryan is a member of the Faculty of Education at the University of Manitoba, where he teaches children's literature classes.